Between the hours of 9am and 4pm, auto traffic and street parking WILL NOT be allowed on the event route. However, through traffic is allowed on Stanford and Powell. For those who need access to and out of streets within the event route,use Stanford and Powell. Via San Pablo Avenue, R/ 40th Street, L/ Adeline Street, L/ Market Street, Into Sacramento Street, L/ Ashby Avenue, R/ San Pablo Avenue and Resume Regular Route. 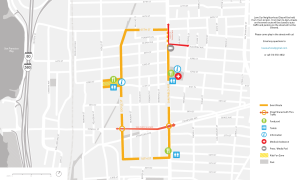 Via San Pablo Avenue, L/ Ashby Avenue, R/ Sacramento Street, Into Market Street, R/ Adeline Street, R/ 40th Street, L/ San Pablo Avenue and Resume Regular Route. Details of activities along the route are here.